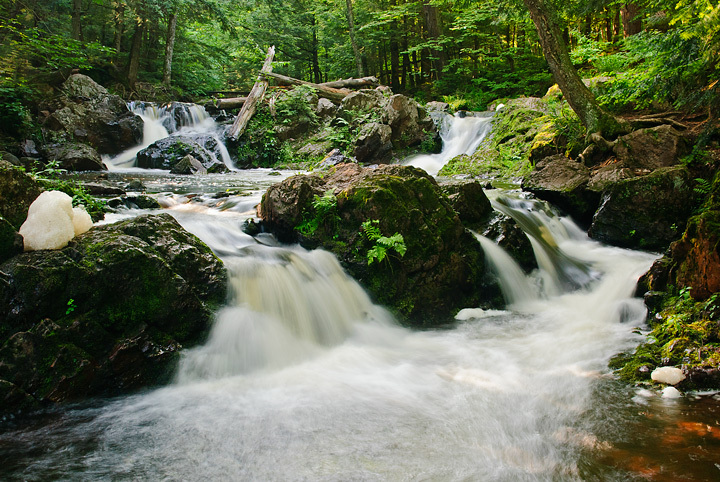 After hiking to O Kun de Kun Falls we drove over to Porcupine Mountains Wilderness State Park. While in the park we happened to find a new waterfall book called Waterfalls of Michigan by Phil Stagg. It turned out that he is in the process of writing four books under the same title but covering different parts of Michigan. At this point he has finished a book covering the Western U.P. and a second book covering the Eastern U.P. 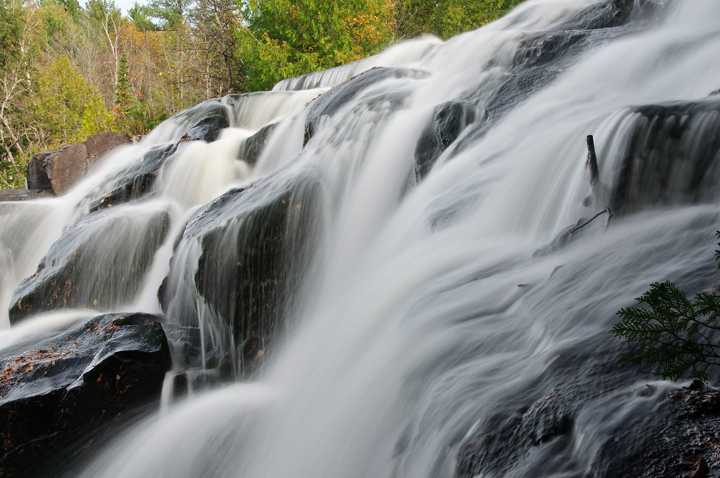 If you are interested in water falling in the U.P. you will want to purchase his books. After a visit to the visitors center we drove up to the Lake of the Clouds. The colors were not at their peak yet but is was still a beautiful site. We could see the Copper Peak Ski jump from the viewing area. It was late in the day and photographers were already lining up to capture this photo. 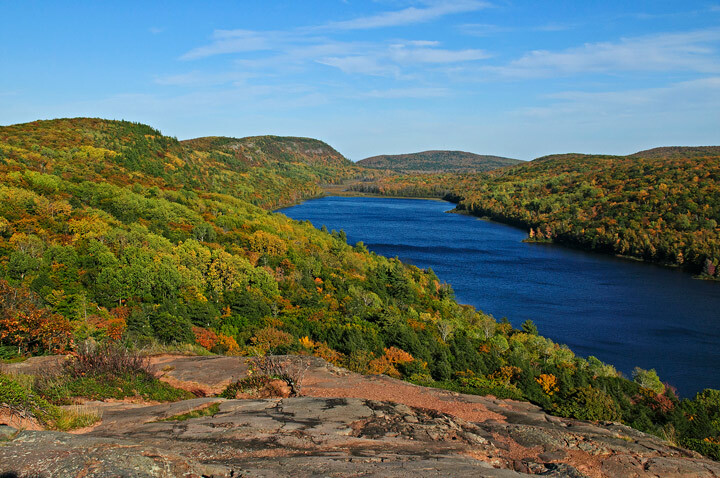 We arrived at Lake of the Clouds in the Porcupine Mountains Wilderness State Park on a perfect day. The temperatures were comfortable, the sun was out and most importantly the fall leaves were at their peak. Very strong winds were on tap for the next several days so we just made it at the right time. 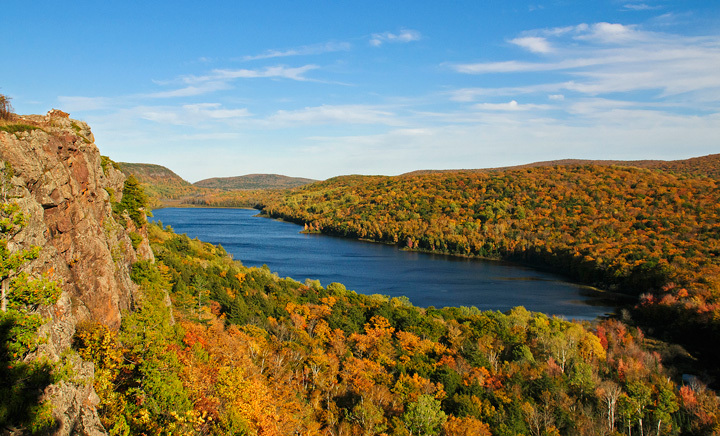 More fall photos from Lake of the Clouds can be found on my website. We spent time at the Lake of the Clouds Overlook before hiking along the ridge above the Lake. Unfortunately we didn’t have time to hike to the end of the lake but we will put that on our bucket list for another trip. On our hike we met an older couple and it turned out they used to live just down the road from us. A small world. 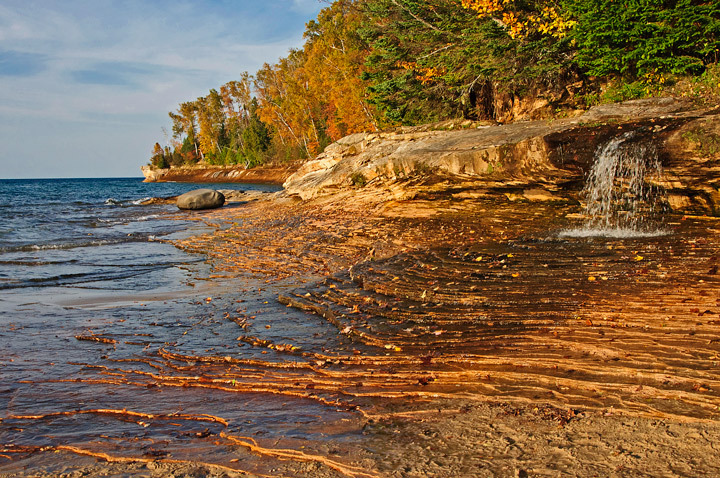 This past week we took a road trip to the U.P. of Michigan. 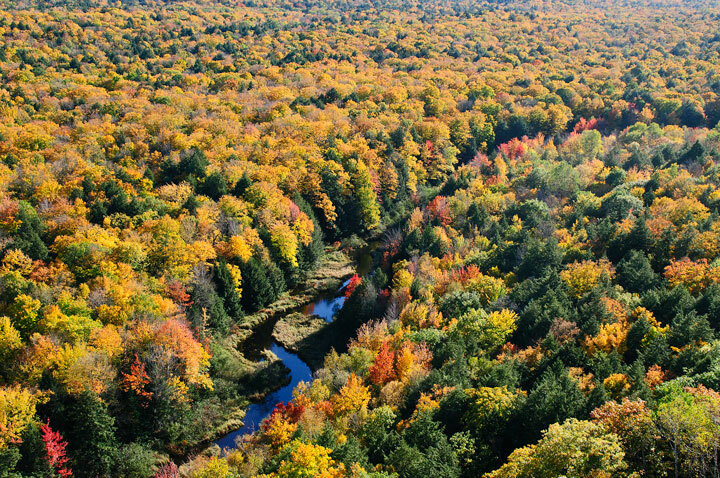 We were searching for fall colors but didn’t know where the search would lead us. Our first night was spent in Ironwood, Michigan. The colors in the area were past peak and were mainly earth tones. When we left home the weather report indicated that we would have four beautiful days. By the time we reached Ironwood the weather report was indicating snow. 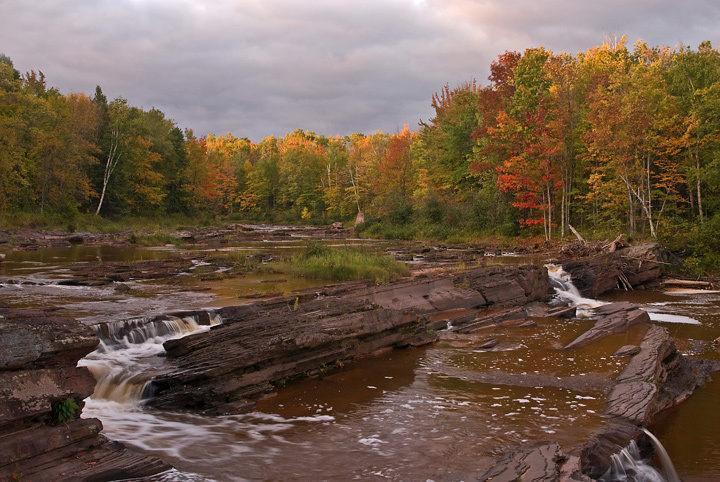 The next morning we decided to drive over to Porcupine Mountains Wilderness State Park and check out the fall color. 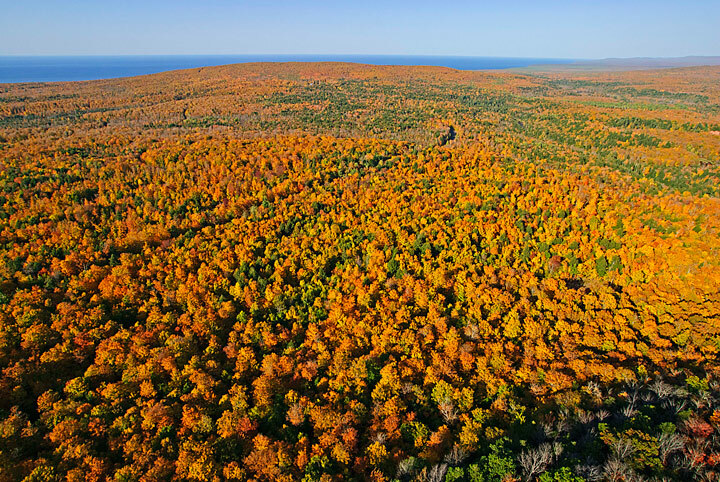 Usually close to Lake Superior the colors turn a little later in the fall. As we drove through the Porkies we found the fall colors to be at their peak so we decided to spend our time in the Porkies. We decided to drive over to the eastern side of the park so we could catch the morning light at Bonanza falls. As it turned out the fall colors were the best I’ve seen them. Unfortunately the drought has left the water level at Bonanza falls the lowest I’ve ever seen it. After leaving Bonanza Falls we made a brief stop at Union Bay to photograph the high waves. This is the first time we have been at Union Bay for several years and were surprised to find that most of the beach was gone because of the high water levels in Lake Superior. We then drove up to the Lake of the Clouds. 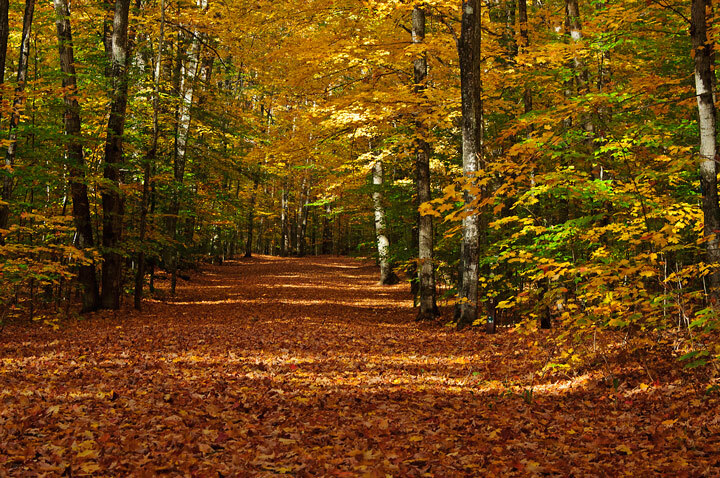 The fall colors in the interior were spectacular although with the strong winds blowing they would not last long. We spent quite a bit of time photographing from the viewing area then started hiking along the top of the ridge toward the east end of the Lake. We then headed back to the South Boundary Road with a stop at the Summit Peak viewing area. The trees on the way up to the viewing stand were backlit and had a beautiful yellow glow. After hiking to the top of Summit Peak we raced back toward Ironwood and drove down to the Black Harbor which is my favorite location for taking reflection shots. I was hoping we would make it before the sun set and we did but just barely. Late in the afternoon is a great time to photograph at this location because of the late afternoon light. We closed our day photographing at Black Harbor before returning to Ironwood. 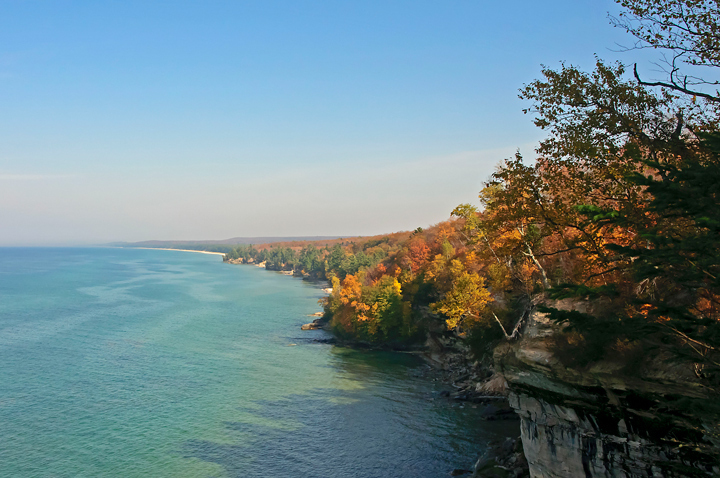 Last week we took a long weekend to make our last trip the Upper Peninsula of Michigan to view fall colors. During the fall color season we have had strong winds so we were not sure what to expect. Day one was a travel day from Menomonie, Wisconsin to Munising, Michigan. There were a few spots where the leaves were still good but for the most part they had blown down in the strong winds. We arrived in Munising late in the day and then headed out through Hiawatha National Forest to check on the tree conditions at a number of lakes. We first stopped at Moccasin and Thornton Lakes. 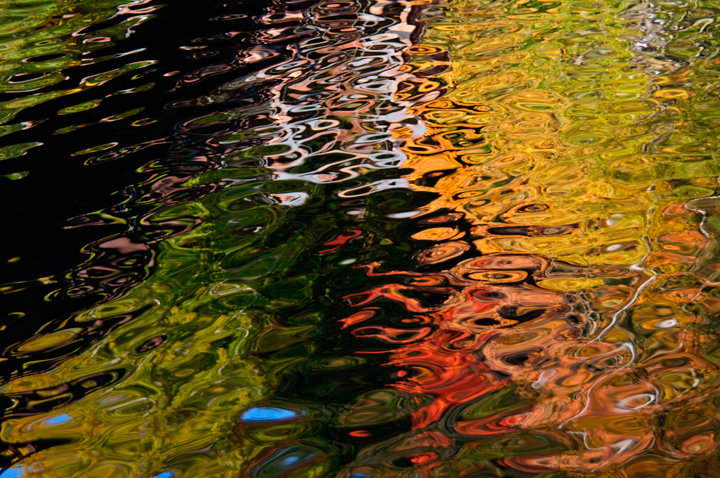 The color at both was good but there was more junk in the water than usual at Thornton Lake. We then drove into Red Jack and Council Lakes arriving just as the sun was setting behind the trees. 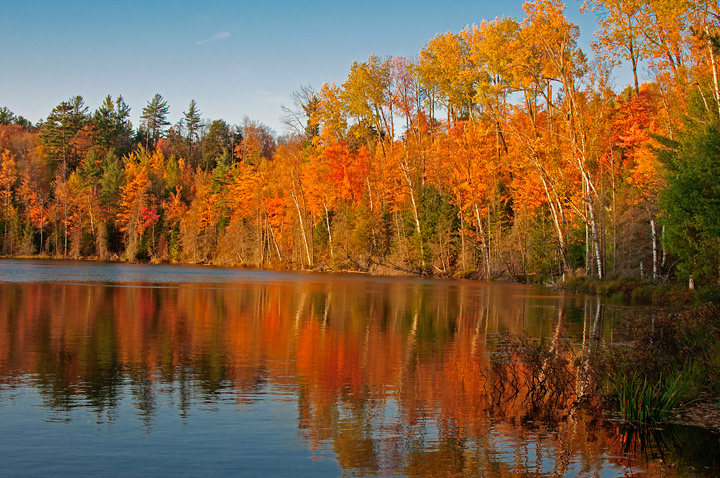 Most of the leaves were down at both lakes except at the east end of the lake where the sun was hitting the trees. This is a shot taken at Red Jack Lake just before the sun set. On the morning of day two we decided to make our first stop at Moccasin Lake. 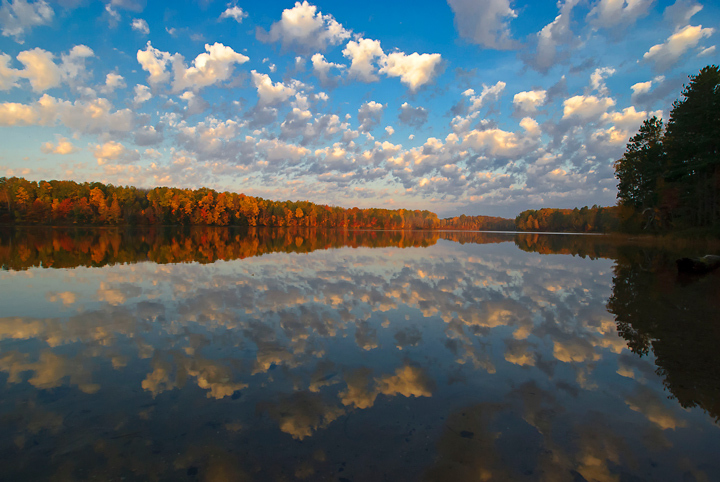 The sunrise was not the best but there were some spectacular clouds in the sky with reflections off of the lake. This was the talk of the morning among the small number of photographers in the area. We then headed over to Petes Lake. The color was also good. This was a shot taken on the campground road. This is usually a great place to find lots of leaves on the ground. After hiking and driving around in Hiawatha National Forest for most of the morning we headed over to Pictured Rocks and the Little Beaver Lake trailhead. We spent the afternoon hiking out to Spray Falls. Unfortunately it was later in the day and the falls was backlit. This was a shot taken along the shore on the hike back to the car. It was late in the day so we decided to stop at Miners Beach to check on conditions and take a few late afternoon photos. 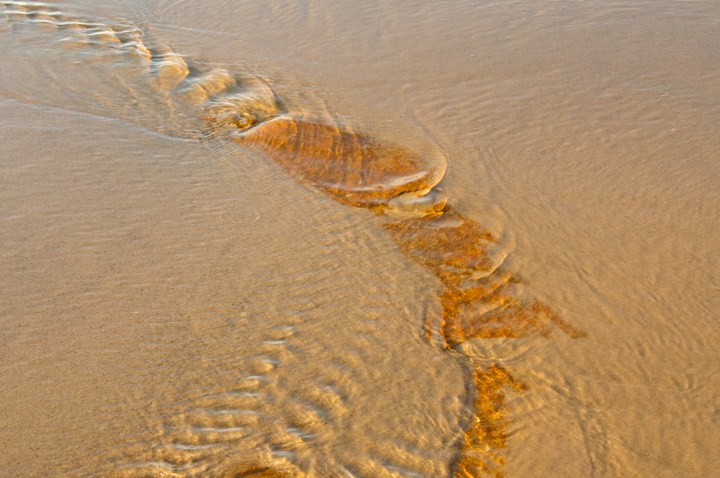 In an earlier post I lamented the conditions at Miners Beach. 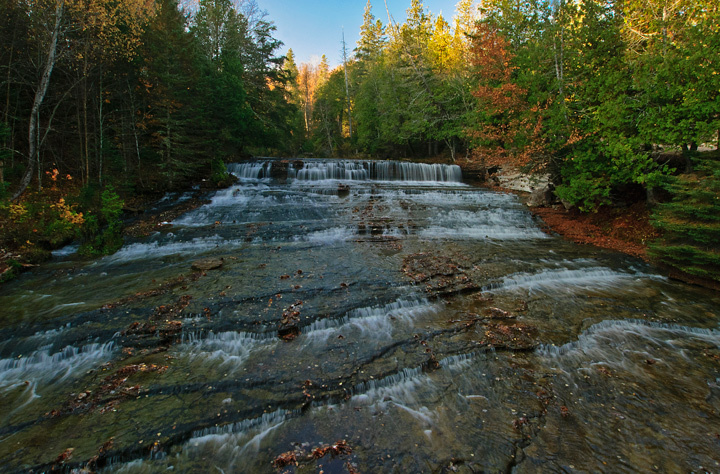 It was almost impossible to photograph Elliot Falls because of the large number of dead trees washed into the area. I was really happy to find that the beach had been cleaned either by nature or someone. The falls also had a little more water flowing in spite of the drought. had seen earlier had returned and he was carrying a large anatomically correct female doll. When I looked he was in the middle of the photo that everyone want to take. I’m not sure what was going on but he was posing the doll. 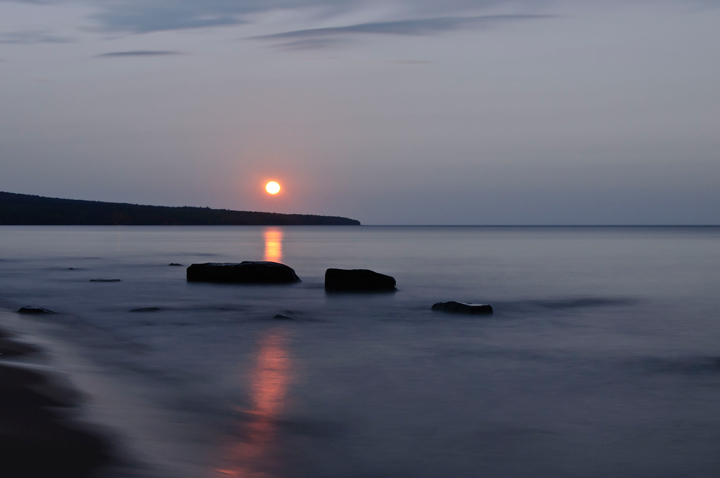 Definitely a first and a topic of conversation among the photographers at Miners Beach that night. I should have gone over to find out what he was up to. We decided to drive out to Sand Point for our sunset photos. It would allow time to pick up something to eat and still make it to the packer game. 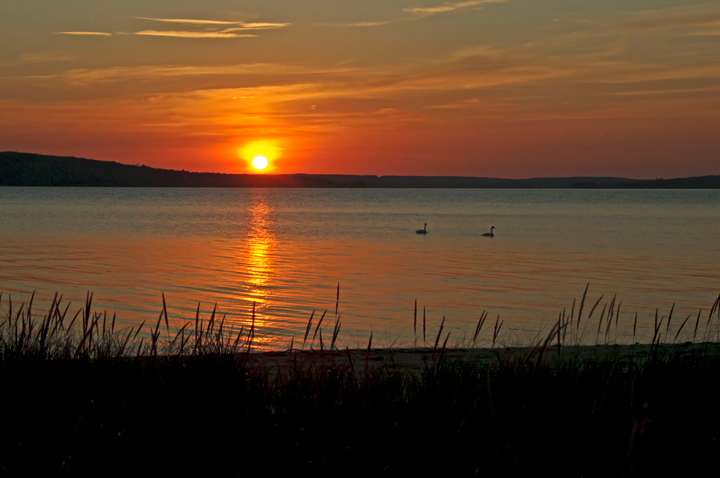 There were a couple of Trumpeter Swans feeding just off of the beach so I included them in my sunset photo. Day three was a waterfall day. Our first stop was Au Train Falls. I had visited several times before and each time found very little water flowing in the falls and had expected the same on this day because of the drought. When we arrived we found a good water flow. The falls is downstream from a dam so there must have been a water release. The next waterfall on our list was Laughing Whitefish Falls. Again I wasn’t quite sure what to expect given the drought. As it turned out there was very little water flowing. It was the lowest water level I had seen at the falls. It did mean there were lots of leaves where water would normally be running. This is a shot taken from the top of the falls. We drove on to Marquette for lunch. We decided we had a little time so we decided to visit Reany Falls. This was my first visit to the falls. Again not a lot of water and there was a considerable amount of downed trees in the falls so it was difficult to get a lot of good shots. 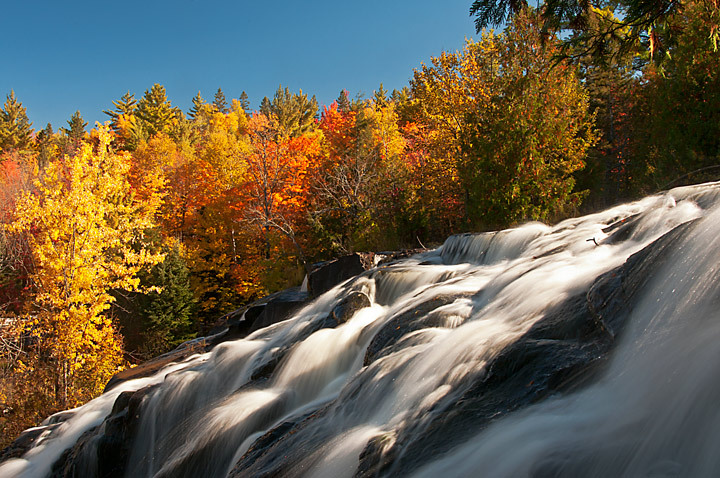 There are quite a few falls in the Marquette area so this looks like a place I’ll be heading to next spring. The next stop was Bond falls. 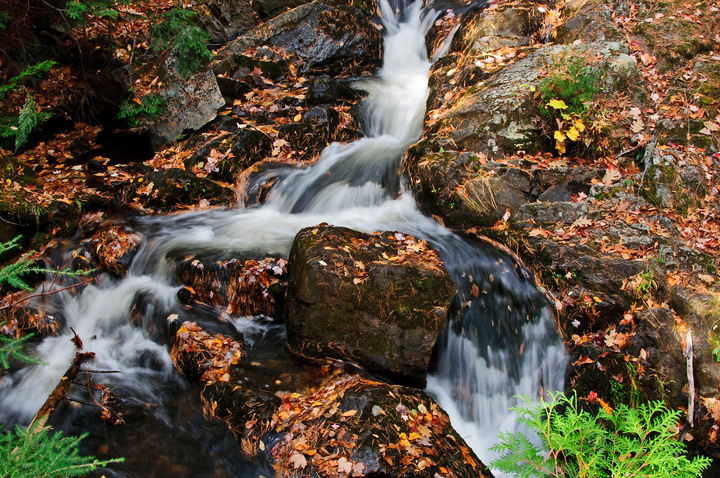 Since Bond Falls is below a dam you can always be assured of a good water flow even during times of drought. We weren’t disappointed although there were few leaves remaining on the trees. 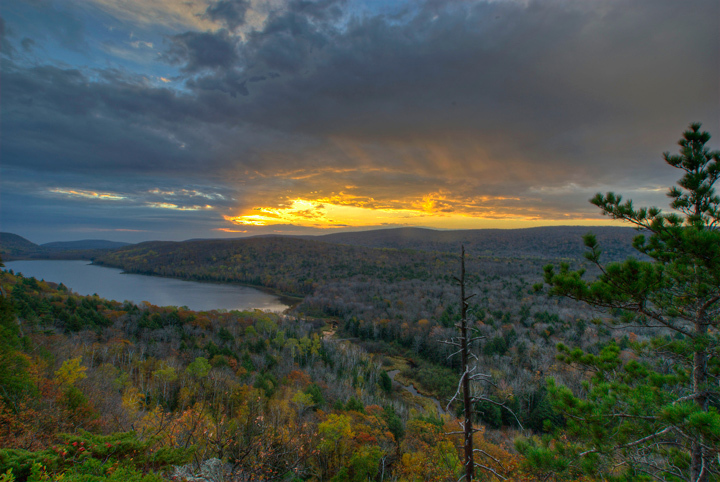 Our destination for the day was White Pine just outside of Porcupine Mountains State Park. We normally stay at the Konteka in White Pine. After checking in we drove to Bonanza Falls. 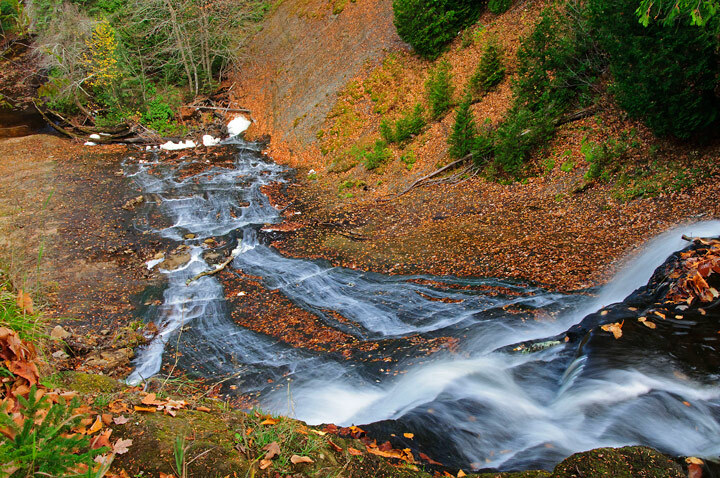 It’s a waterfall that is close to the road and under normal conditions offers a large number of photographic opportunities. In this case the water level was the lowest I have ever seen it so the photographic opportunities were limited. The final stop of the day was Union Bay for some sunset photos. Unfortunately nature didn’t cooperate and there was not much of a sunset. This was about the best nature had to offer on this night. 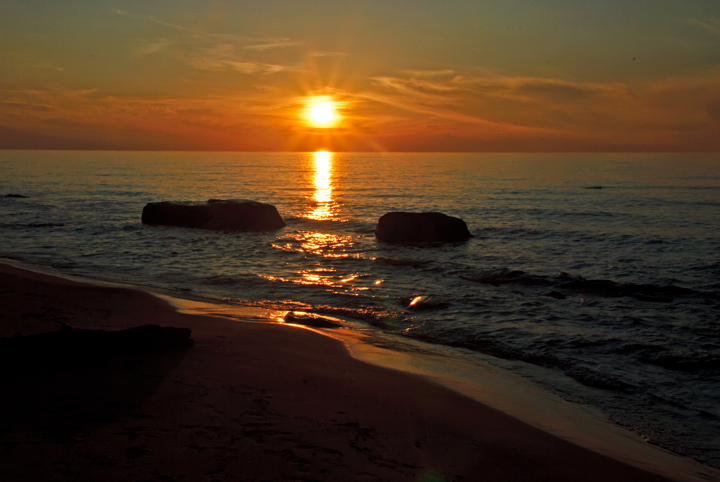 On the positive side it was an incredible evening to be on the beach. the temperature was 70+ degrees and no bugs. In fact the entire trip we had daytime temperatures in the high 70’s. We were up early the next morning to try and catch the sunrise at Lake of the Clouds. On the way to the car we noticed that it was not very likely that we would have a good sunrise because of extensive cloud cover. However, as we drove toward the park we noticed that the full moon was just setting over Union Bay. We parked and raced down to the beach to catch some photographs. As it turned out there was not much of a sunrise at Lake of the Clouds. We did catch the sun peaking through the clouds a little later in the morning. Almost of the leaves were down in the park and there was very little color. Looks like the end of the fall photo season and it came way too soon. Yesterday was one of the strangest days I’ve ever had. The day took a strange turn starting the evening before. 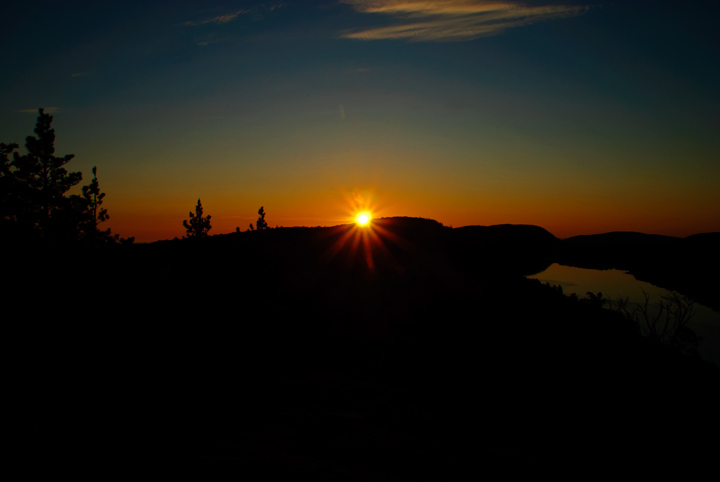 When I checked into the motel I asked for a 4am wakeup call so I could get up and photograph the 5am sunrise at Lake of the Clouds in Porcupine Wilderness State Park. The clerk didn’t think I could get a 4am wakeup call because the bar closed at 2am (apparently it was not an automated system). I was fine with that. Later, as I was photographing the sunset at Union Bay I remembered that although the Michigan border towns observed CDT, White Pine was on EDT. In other words I should be getting up at 5am EDT rather than 4am. Since I didn’t think I was going to get a wakeup call I forgot about it. Sure enough the next morning I received a wakeup call at 3:45 am (2:45am CDT. This should have alerted me that this was going to be a crazy day. When I arrived at Lake of the Clouds and setup the camera I noticed there were lots of birds around. I moved away from the camera to check out another shooting location and when I turned around there was a bird sitting on the camera. This was definitely a first. Unfortunately I didn’t get a shot of this. To top it off the sunrise was not all that spectacular. 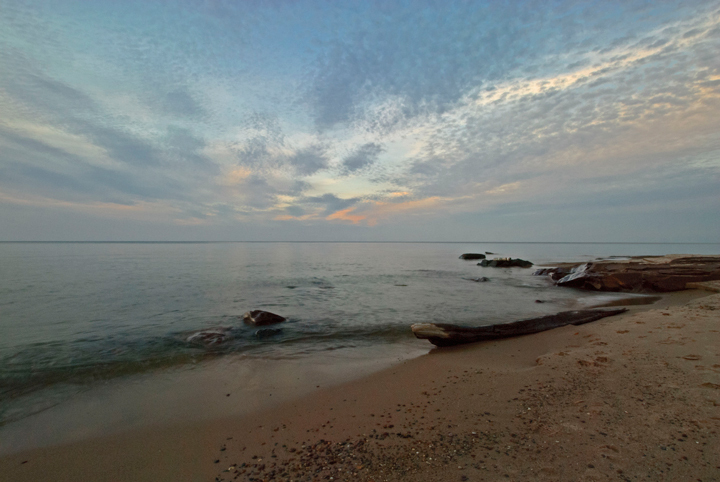 A little later in the morning I was walking along the shore of Lake Superior at Union Bay. As I approached some rocks along the shore I noticed a Hooded Merganser moving out into the lake. All of a sudden there was a flurry of movement among the rocks and I saw a bunch of babies dashing to follow mom. They raced as fast as they could and ran right up onto mom’s back. I think there were seven in all and at one point five of them were riding on mom’s back. She seem to follow along as I walked down the shoreline. The babies would dismount and mount as mom paddled down the lake. Another first for me. I was a little far away but I did manage a shot of the action. I then started driving out of the park on South Boundary Road. Something caught my eye along the edge of the road. It was a baby bird and it started to dash across the road in front the car. There wasn’t much I could do and I drove over the bird. I looked in the rear view mirror and noticed the bird lying on the road. I thought for sure it was dead. All of a sudden it jumped up and quickly finished its dash across the road. I think the wind from the car must have blown it over. Another first. A short time later I saw what I thought were some black garbage bags along the road and wondered what was up with that. As I drew closer I discovered it wasn’t garbage bags but a medium sized black bear. He looked at the car and fortunately headed for the woods. Not long afterwards something hit the driver’s side windshield. At first I couldn’t figure out what it was but it turned out to be a frog. He got himself oriented as I drove along the road and stayed with me until I found a place to pull over and remove him from the windshield. The only thing I can think of was that it fell out of a tree along the road. Another first. 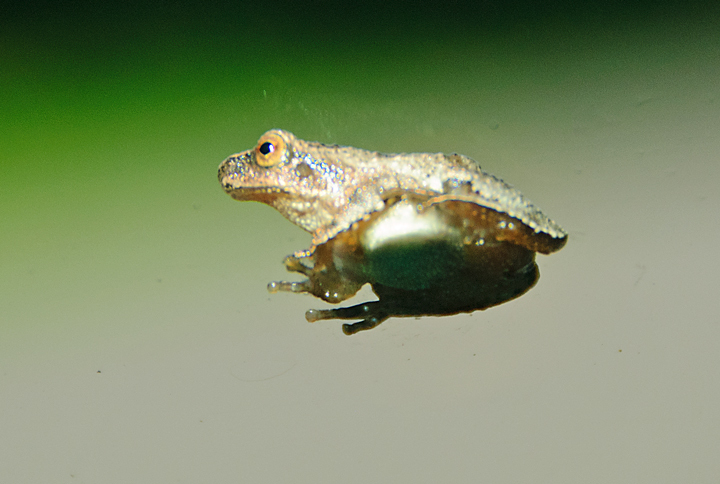 This is a shot of the frog through the windshield. Next I noticed a doe and two fauns along the road and was so busy looking at them that I started to drive off of the road. Apparently I steer the car in the direction I’m looking. Fortunately I looked up just as I was about to hit a guardrail. 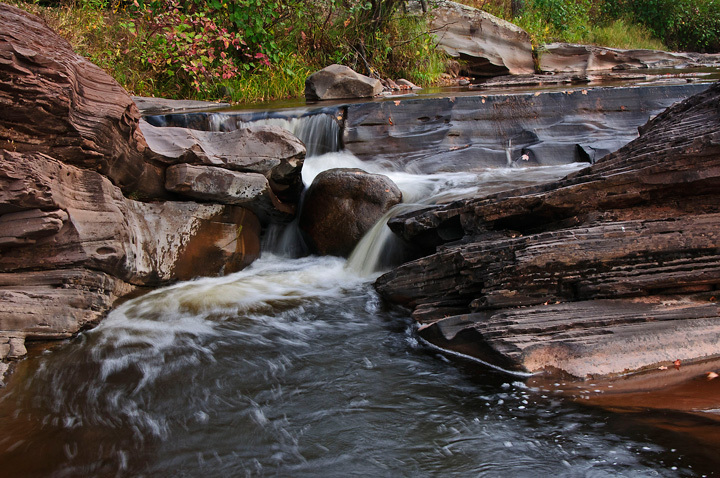 After that I needed a break so I stopped at the Little Carp River to take a few waterfall photos. I thought things would end once I made it off of South Boundary road but they didn’t. Driving south of Mellon, Wisconsin on county GG a small black bear, probably born last year, made a full speed dash across the road in front of the car. I slammed on the breaks but still hit him. I think I must of just hit his hind quarters. He kept going full speed into the woods. There wasn’t any place to stop so I kept going until I found a place to pull over. I checked the car for damage and couldn’t find any. After some reflection I decided that discretion was the better part of valor and decided I wasn’t about to go back and walk into the woods to check on the condition of a wild black bear. Another first. I finally managed to make it home without any more incidents.